I have been flying to California since 1996. 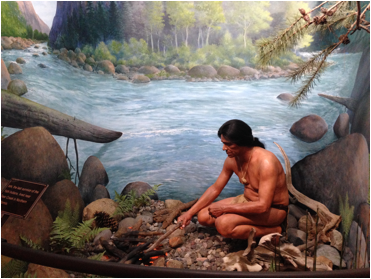 All of the trips have had something related to the story of Ishi, the Last Stone Age Indian in North America. The crux of the story is that this little band of Yahi Indians hid their village for about 40 years in the foothills of the Cascade Mountains in Northern California. Many people think that they lived in a cave, but that is not true. 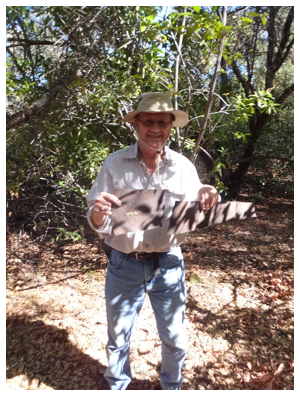 It was on a flat plateau. The village, far above Deer Creek, was called �Grizzly Bear�s Hiding Place�, and it was their home from about the 1870�s until 1908. It was discovered and pillaged by some surveyors. Only four members of the tribe were still alive at this time. 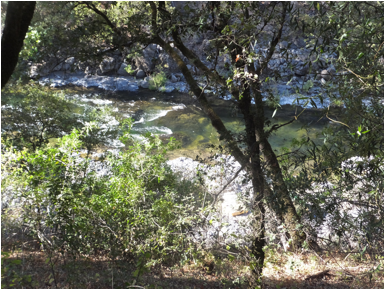 Two ran off, and it is presumed that they drowned trying to cross a creek. Ishi�s sickly mother was in the hut, and was left unharmed, though they took most of their earthly possessions. Ishi hid from the surveyors. 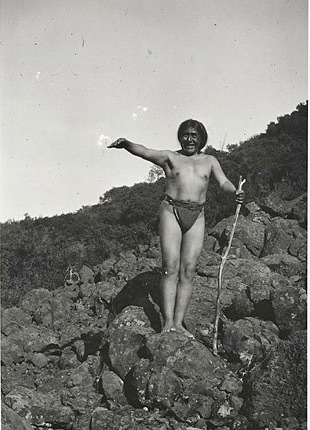 Ishi was �captured� in 1911, and spent four years giving valuable information on the customs and ways of the Yahi until his death in 1916 of tuberculosis. Grizzly Bear�s Hiding Place, known to the Yahi as �Wowunupo'mu Tetna�, is the place that I have wanted to visit since I first learned about the story of Ishi. Very few people know the actual location of this village site, and it is so remote that most folks would not even attempt to get there. But I have this archeologist friend who had been there a couple times, and does know the actual specific location. 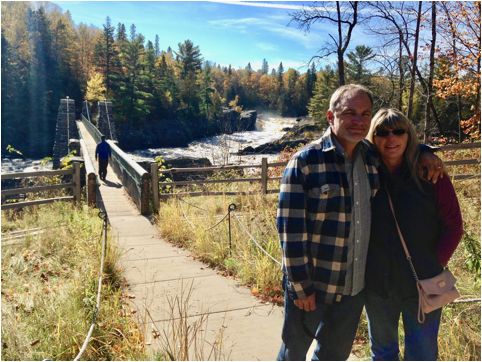 Mike and I worked out the logistics via long distance, me in Minnesota and Mike in California, to actually make the visit to Grizzly Bear�s Hiding Place. 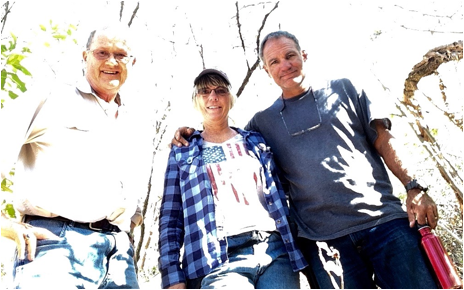 Lauri, Mik e�s wife, accompanied us on the trek, and soon we were setting up our tents on the banks of Deer Creek. 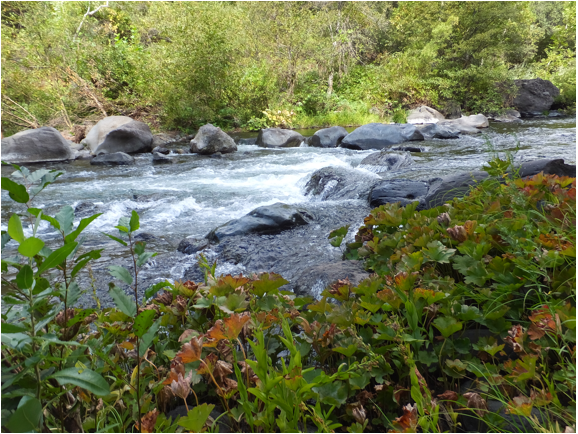 The creek was flowing at a pretty good clip, and it was probably three or four feet deep or more in places. After we had gotten settled in the campsite tucked on a small spit of rock, with just enough room for two tents, we got ready to ascend a very steep hill to get to Grizzly Bear�s Hiding Place. 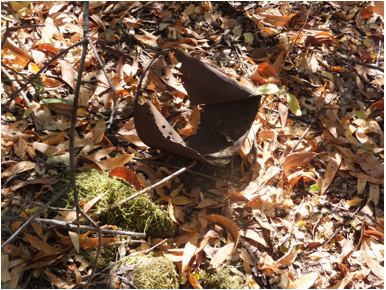 Mike had warned me of the treacherous footing, and had strongly recommended that I purchase a pair of hiking crampons because the climb, while steep, also had a lot of loose and shifting soil, rocks and leaf debris. They were a great idea, and I�d probably be there yet trying to climb if I hadn�t had them. Pictures cannot do the climb justice. 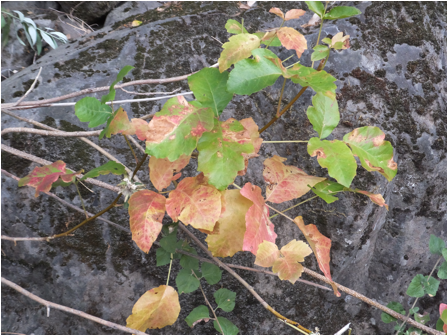 Poison oak was everywhere, and there were times that I needed to grab it just to keep my balance. Brush, dead branches, soil that gave way as I stepped on it, and a climb that was at about a 45 degree angle for the majority of the climb. It was also very tiring. While I exercise quite regularly, I do it pretty much on flat ground. This was the antithesis. Mike and Lauri are not only physically fit, they are about 20 years younger than me. I told them that when they are 72, they should replicate this trip and think of me. I�ll be 92 at that time, and probably won�t join them. 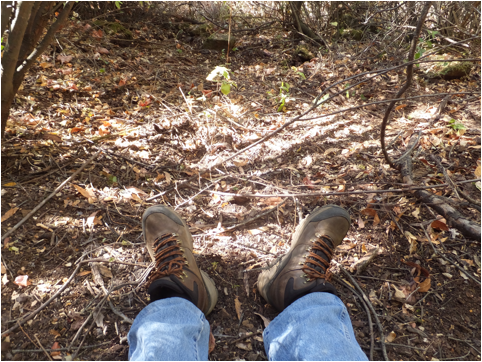 The brush was so thick, and the ground so loose that I was getting pretty exhausted, and I�m sure I slowed them down a bit, but I really like the fact that they did not make a big deal out of it. They could have coddled me and made all sorts of exceptions for me because of my age, but they didn�t. They treated me like they would have as one of their equals, and I really appreciated that. When we finally did get to the plateau, I was pretty much sweaty, out of breath, and ready for a big drink of water. And flat ground. While the ground was pretty level, it was not easy walking. 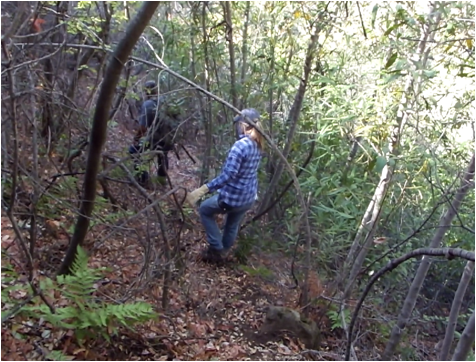 There were still lots of brush, poison oak, downed logs, and vines. And soon, there we were at the Holy Grail, for me, of the story of Ishi and the Yahi. Grizzly Bear�s Hiding Place. Wowunupo'mu Tetna. It was a place I never thought I would see, and I was much more moved and emotionally taken by it than I thought I would be. It was almost a reverent feeling, especially around where the house pit stood. Mike did some looking around in the pit area where the actual house stood, and found several artifacts, including some pieces of glass and some metal remains of a can. 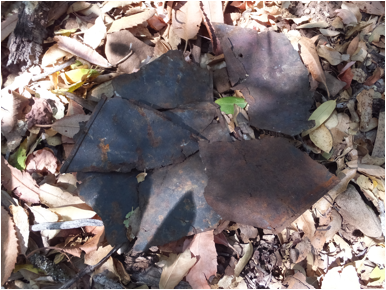 These were documented and replaced where they had been found. Mike and Lauri went off to do a bit more exploring of the area, but I decided to stay back and just soak up some of what I was seeing. I went to the house pit, leaned my back against some large stones, and sat there for 30 or 40 minutes. The silence of the area was eerie. I could hear the breezes blow, hear the birds singing, see the butterflies flitting by, the smell of the bay trees, the clouds drifting by, the silence of everything but the sounds of nature, and I was thinking that this is exactly the way it was in Ishi�s time in this very location. 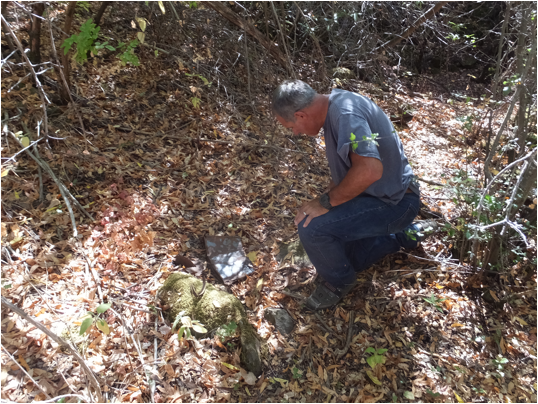 Soon, Mike and Lauri came back and we started looking around the area for more signs of the past. 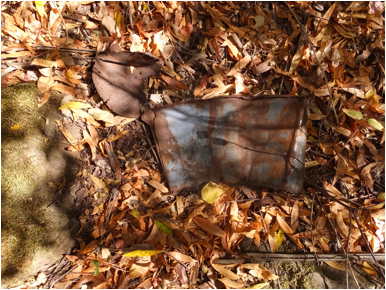 We found remains of an old tin can, a broken hand saw blade, the rusted remains of a �Log Cabin� syrup tin, which was mentioned in Kroeber�s book, the remains of a pail, all left in place for well over a hundred years. 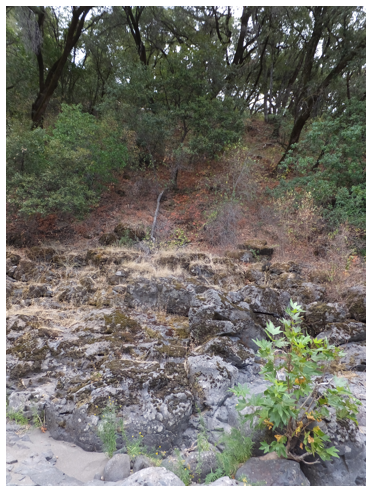 Mike took us to what was called on the map, a �Loose Rock Slide� and showed us where Ishi had been photographed in 1914 when he returned to this area with the anthropologists. With my crampons still on my boots, I did manage to slip and fall on the slippery rocks, but only lost a little skin on my knuckles and a bruise on my right knee. 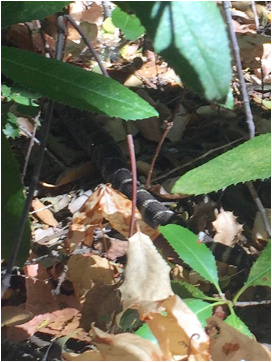 On our trek we did run into a rattlesnake on the trail. It did not rattle, but just slithered off into the brush. 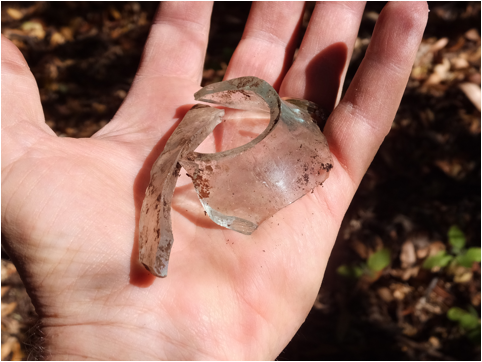 Mike did some more exploring in the house pit, and found several more items, both glass and metal. 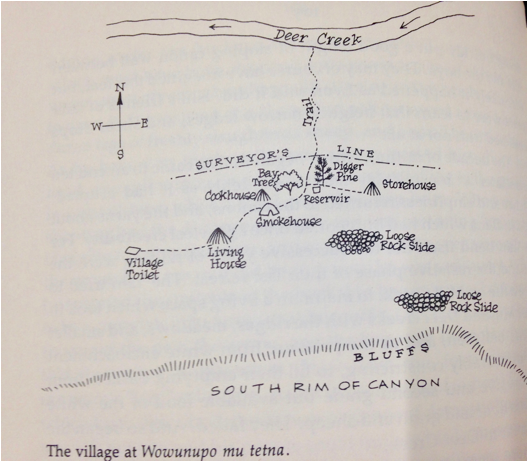 He documented the location, drew a diagram of the pit, and listed each item. He then carefully put them back where they were. 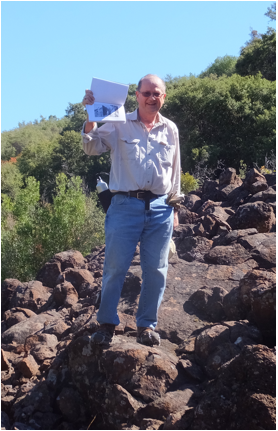 We hiked around the area looking for signs that matched the map of the village, and found a couple more sites. I decided we should document the fact that we were at Grizzly Bear�s Hiding Place by taking a photo, so I set up my camera in the only place we could find that was open enough, and I took this picture with the sun in the background. Not the greatest shot, but it does capture the moment. Soon it was time to head down the very steep slope to our camp on Deer Creek. The descent down is as treacherous as going up, and in some ways more so, because there was the danger of getting up too much speed and losing control. 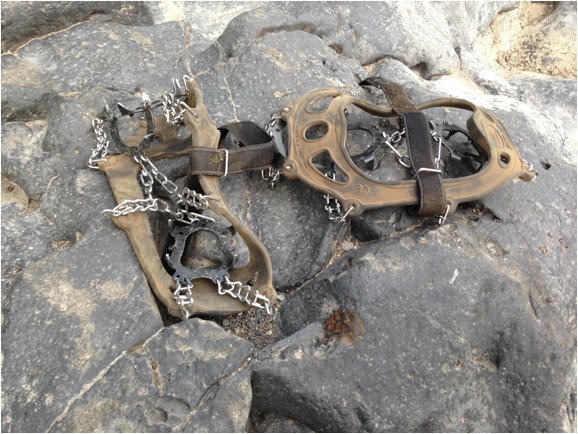 The crampons again were very useful. Often, I aimed for a small tree ahead and grabbed it as I went by to slow down. 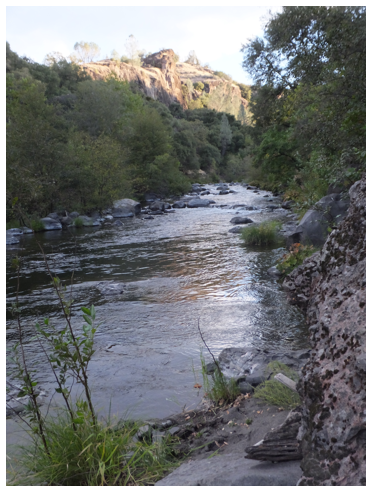 Soon, we could see Deer Creek far below us, and we got back to our camp site. 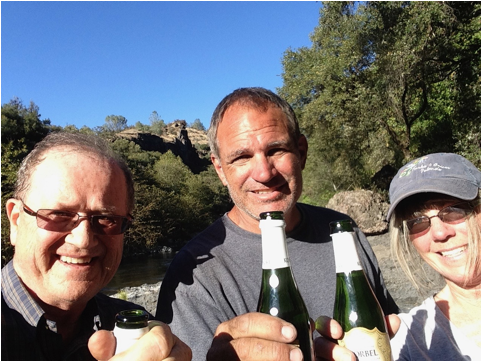 Mike and Lauri surprised me with with a small bottle of champagne that had been cooling in the creek to celebrate our time at Grizzly Bear�s Hiding Place. I was pretty tired, and it tasted wonderful, and I really appreciated their thoughtfulness. It was a time to celebrate. We had also brought a small box of wine along with also was cooled in the cold waters of Deer Creek, and we had a baguette with a chunk of parmesan cheese for an appetizer. Along with the wine, it was great! 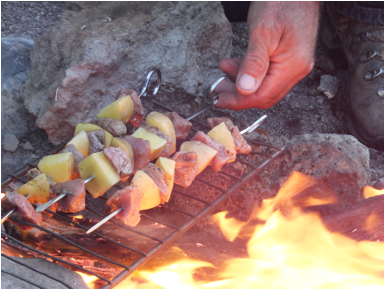 We had steak and potato skewers as our main meal and it tasted wonderful! We talked about the day, and spending time in the village, and I told them that I had experienced everything that I had hoped for on the trek that day, and that I really didn�t need to return to the camp on the next day. There really was nothing more I could hope for in another visit that I hadn�t done today. Lauri felt pretty much the same way, and that would give Mike all the time he needed to do the exploring that he wanted to do. I had brought walkie talkies along, so we could be able to keep in touch. 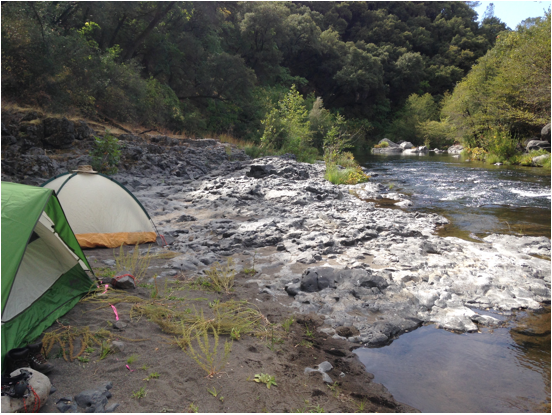 Soon, we turned in for the evening, and I struggled to get comfortable in my tent with a slippery air mattress, a slippery sleeping bag and a slippery pillow plus all my gear. 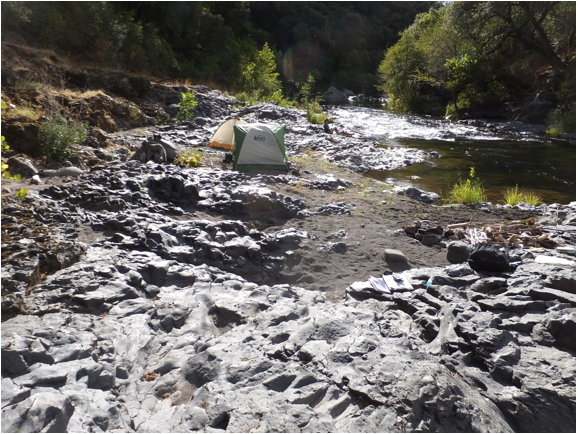 I never sleep well camping, but the sound of Deer Creek, and later a full moon, were a part of a great experience I was having, and it really is the only way I would ever see it or experience it. Next morning, after a leisurely breakfast and a cup of coffee, Mike headed back up the hill to do some more exploring while Lauri and I stayed in camp. I could feel the exertion of the previous day in my legs and hips. I gathered quite a bit of firewood for the evening meal and the following morning. Most of it was a very soft driftwood, so it burned fast. I spent a share of the day taking photos of the beautiful setting we were in, and reading a couple books I had brought along. Lauri did pretty much the same. Mike returned to camp mid afternoon after spending several hours at Grizzly Bear�s Hiding Place. 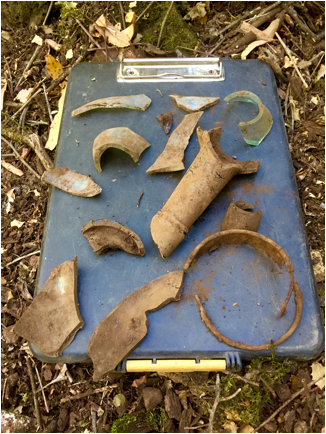 He was disappointed that he hadn�t found any small pieces of obsidian or glass from Ishi�s flintknapping, but did explore the pit more, and found more artifacts that he documented. He also found some of the trails shown on the map. We had a leisurely evening, finished the wine, and had some pretty good food that had been dehydrated and rehydrated with boiling water. Lauri had started to come down with poison oak on her arms, so she was feeling a bit on the itchy side. We turned in early again, and I awoke very early again, and gathered some more firewood. Soon, we had eaten our breakfast, gotten all packed up, and we headed back to civilization. The trip had meant a lot to me, seeing the site of the ultimate place in the Ishi story. 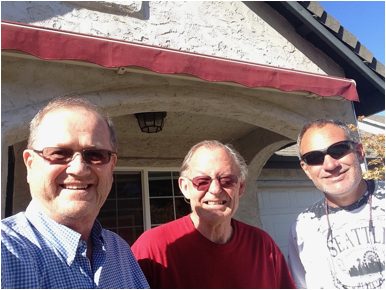 The next day, Mike and I drove to Chico with catch up with Richard, who has meant so much to me for encouraging me to pursue my interest in the story of Ishi and his tribe. The next day, we got together with Bob Price, who has also been a part of so many of my trips, including the first visit. But there�s a little bit more to the story�. Mike and Lauri flew to Minnesota the same day I did on an earlier flight, and spent the next three days visiting Mike�s aunt and other relatives and seeing some of the Minneapolis/St. Paul sites. 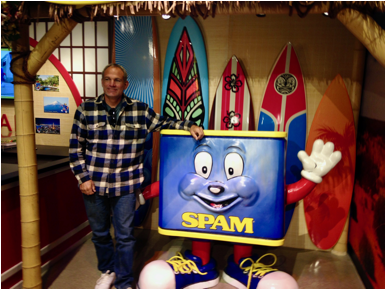 We picked them up after they�d returned the rental car, and headed to Austin to the SPAM museum, which they said they�d like to see. 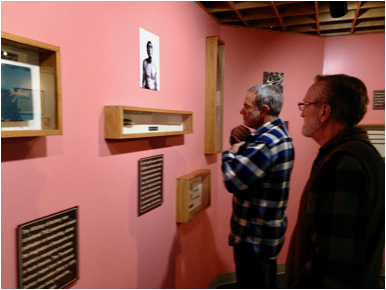 From there, we went to Chatfield t o the Pope-Young Bowhunting Museum, and had a great visit with Larry, the museum curator. They have lots of information and a diorama about Ishi. From there we went to Cambridge, spent the night, and headed to Duluth the next morning. 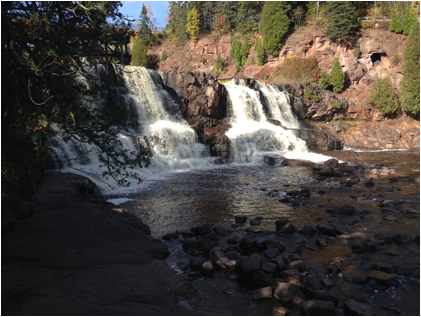 We stopped at Jay Cooke State Park and Gooseberry Falls State Park, and spent the night in Duluth. 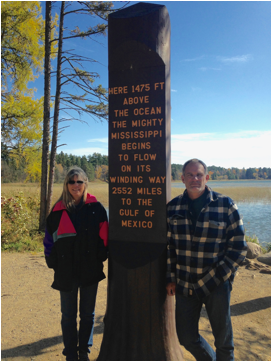 From Duluth we headed to Itasca State Park where Mike and Lauri walked on the rocks across the source of the Mississippe River. 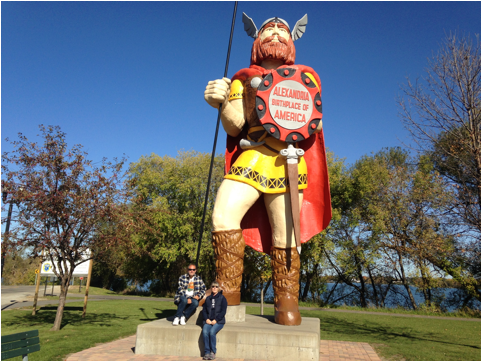 Last day was spent in Alexandria with Big Ole and the Kensington Runestone. A lot to see in a few days! 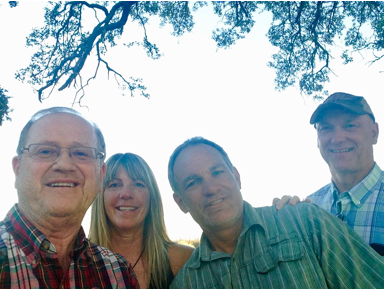 Then out to eat with Derek and Zo� and then we dropped them at the airport for their flight back to Sacramento. It was quite the couple weeks. 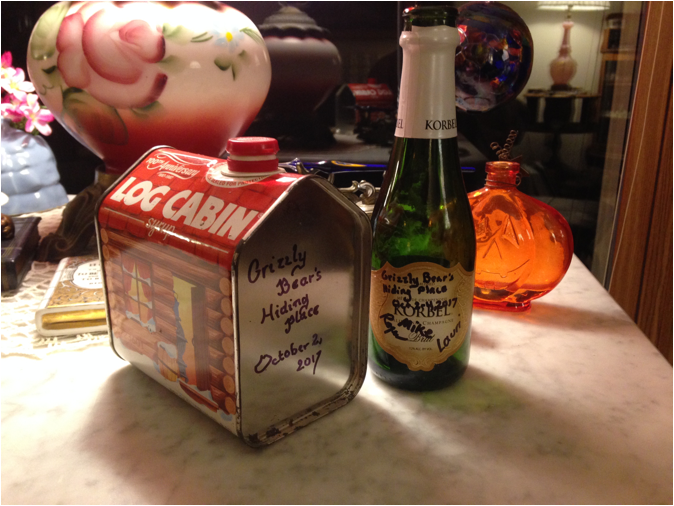 Here are a couple of my remembrances about the trip�.the signed Champagne bottle, and a replica, though smaller, of the Log Cabin Syrup tin like the one found in Grizzly Bear�s Hiding Place.